For the second installment of the wardrobe staples series, I thought I would share with y'all one of my favorite parts of my wardrobe - jewelry! To me, jewelry is a very personal thing, more so than any other part of your wardrobe. When you're building the jewelry portion of your wardrobe, pick classic pieces that you can wear every day with whatever outfit you have on. You'll instantly look pulled together with minimal effort. When you start picking out your jewelry, you should start by choosing the metal color that goes best with your skin tone. For me, it's yellow gold, so most of my pieces are going to be in that tone. Don't get me wrong, I have silver and rose gold and love to mix them, but it just makes it so much easier when all your signature pieces are one color. Dangly Earrings // If you decide to go with color when picking these out, I suggest going with a color you wear frequently or one that contrasts colors you wear a lot. An easy alternative to color are a pair of Kendra Scott Danielle earrings in black. They will go with just about anything! Monogram Necklace // Oh how I love my monogram necklace. I wear it almost every day and layer it with my dainty necklace and sometimes even a statement necklace. The one I have is from etsy and is 2 inches. 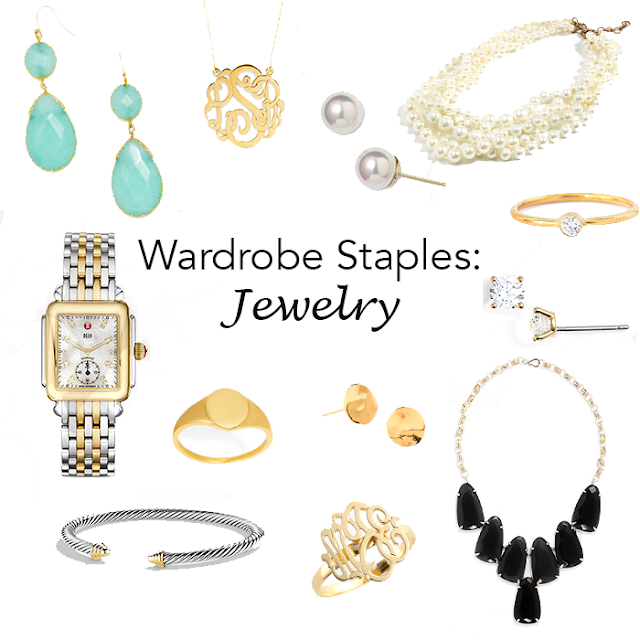 Another popular style is this one from Baublebar. Pearl Studs // When in doubt, wear pearl earrings. If I'm stuck on what earrings to wear, these always end up being the ones I choose. You can choose to save or splurge and either will look absolutely fabulous. Pearl Necklace // The one that I've linked is definitely a bold and fun alternative to the classic pearl necklace, but still looks super classy. If you choose to go the more classic route, here's a splurge option and a save option. Dainty Rings // This is something I just started working into my jewelry rotation. I always thought I couldn't pull these off with the rings that I wear every day, but after finding these in the NSale, I'm fully convinced. I also love this cute little one! Diamond Studs // There's lots of different cuts to choose from, and no matter which you choose, they'll never go out of style. I've linked a CZ option, but if you choose to splurge, here's a great option. Statement Necklace // With so many options out there, it can be hard to choose one that will go with more than just a few outfits. My advice is to choose something like the Kendra Scott I linked in a neutral color or something like this one with a clear quartz stone and one metal color. Signature Ring // For me, my signature rings are my wedding set and my Aggie ring and I honestly feel naked without them. If I didn't have either one of those to wear, I would definitely look a monogram or signet ring that could eventually become an heirloom for future generations. Simple Bracelet // It's no secret I love bracelets. Emphasis on the plural part of that statement. But when I'm in a rush to get ready, a simple bracelet is all I'll put on with my watch. I love to choose either a mixed metal, like the one I linked, or go with my metal color, like this one with a stone or this one with pearl accents. Watch // Now, this may be Kyle wearing off on me, but I'm a firm believer that your watch should definitely be an investment piece. Watches are something you can wear for the rest of your life if you buy a classic style, and can eventually become something that you pass on to your children. I've linked a Michele watch, which is the kind that I have, and I love it because you can easily switch the bracelet to a leather band by yourself. I also love this Daniel Wellington watch that also has lots of fun straps. If you're looking to splurge, the Cartier Tank Solo is the ultimate classic women's watch. With all jewelry, I definitely recommend doing your research before you decide to invest. There are so many different options out there at all different price ranges and you can definitely look fabulous no matter how much you decide to spend!